Can be "one time focused"
Fits on almost any air rifle. But not much better than nothing! If you own a 4 x 32 bundled airgun scope like this one, the advice from the HAM Team is simple. "Replace it with something better!" Optical quality is really poor on all counts. Magnification is actually 2.9 x and not 4 x, as claimed. Buying a replacement scope and rings will most likely allow you to shoot MUCH more accurately than you can with this bundled scope. 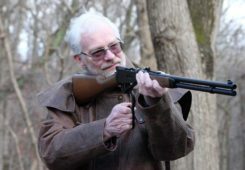 Mechanically, there's no sign of lens bracing to resist the fierce forward recoil of the powerful break barrel air rifle it's sold with. The rings are very flimsy too, so it's unlikely that this scope will have a long life unless you get very lucky. For our first HAM airgun scope test, we’re looking at a 4 x 32 bundled airgun scope. 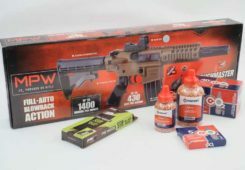 This is about the simplest scope available and almost all of us have bought one at some time – typically with our first air rifle, because it came bundled in the box. 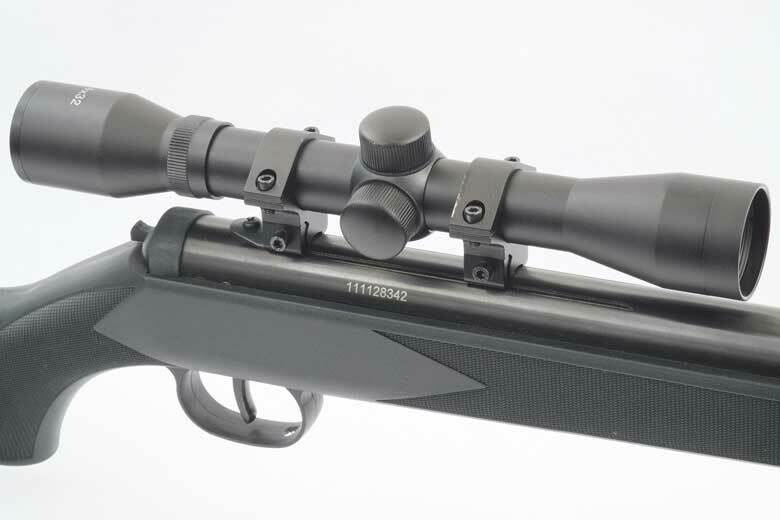 For this 4 x 32 bundled airgun scope review, we’re deliberately keeping the brand anonymous. 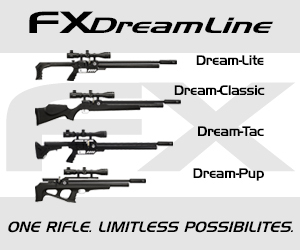 That’s because all manufacturers of low priced airguns include these scopes with some of their rifles. We don’t want to strike one company unfairly at the expense of others selling essentially the same product! This scope definitely was NOT supplied by the manufacturer of the rifle we mounted it to for photography. 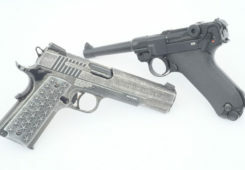 Typically these are break barrel guns sold primarily in big box sporting goods stores. 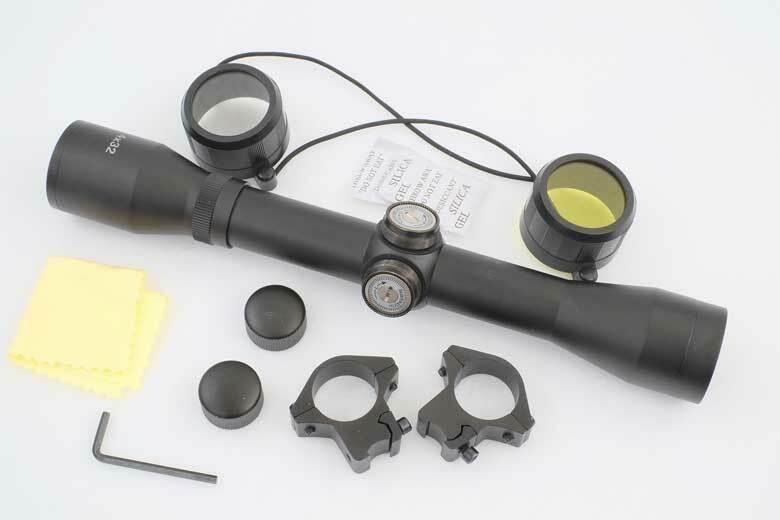 In fact, these scopes are manufactured in huge quantities by scope manufacturers in Nantong, China. The air rifle manufacturer does not make the scopes themselves, the scopes are just branded for them. 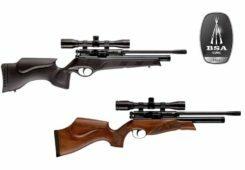 Because a 4 x 32 bundled airgun scope is included in the price of the air rifle, it’s not clear how much you are paying for it. However, you certainly are buying it – it’s not “free” with the gun! In fact, this 4 x 32 bundled airgun scope probably costs the buyer about $20.00. That’s including the rings and accessories. 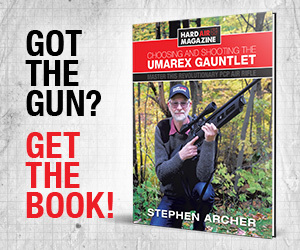 When similar 4 x 32 scopes are “unbundled” – that is sold separately from an air rifle – they typically cost $30 – 35. That’s understandable because of the separate packaging, distribution and marketing costs associated with such a product. Typically, these unbundled versions usually have better rings, too. Either way, you’ll find the scope, some sort of rings, lens covers, caps, a lens cleaning cloth and caps for the elevation and windage turrets. These specifications are provided by the manufacturer, except for the reticle position (which is obvious). They’re very typical for this type of riflescope. 7 Feet at 25 Yards. 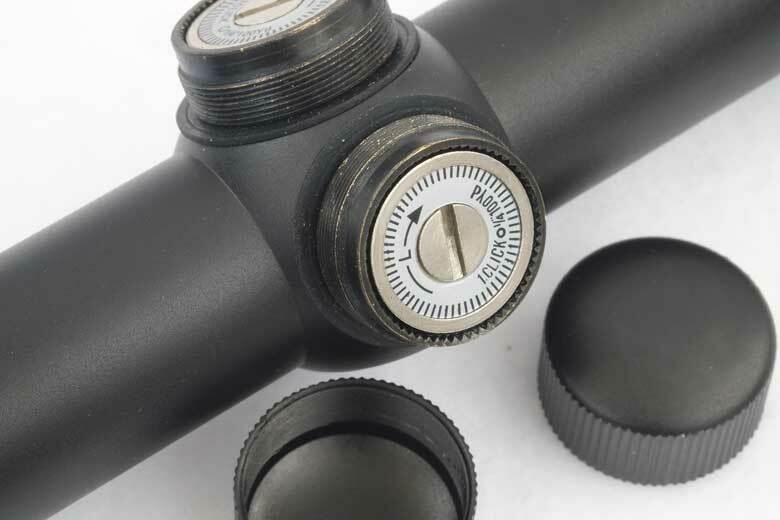 The specifications for this 4 x 32 bundled airgun scope are supplied by the manufacturer, or measured where appropriate. 0.06 Inch at 25 Yards. The Duplex reticle is very simple. The thick wires make it easy to see. 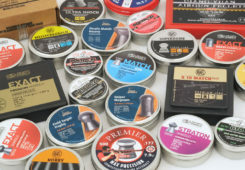 The big problem for airgun use is that there’s no dot or hash mark graduations. We cover this more in the “Buying And Owning” section of this review. Both windage and elevation turrets are capped. Removing the caps allows the turrets to be adjusted using a U.S. Penny. When rotated using this tool, the clicks are precise and easy to feel. We counted 530 clicks of total travel for both the elevation and windage turrets. 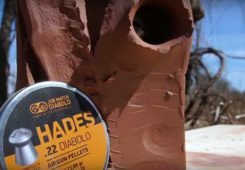 At the claimed “1/4 Inch at 100 Yards” per click, this equates to a total adjustment range of 33 Inches for both elevation and windage at an airgun-friendly 25 Yards range. Is this an “airgun rated” scope that’s suitable for use with powerful spring/piston and gas ram air rifles? There’s no statement to that effect. 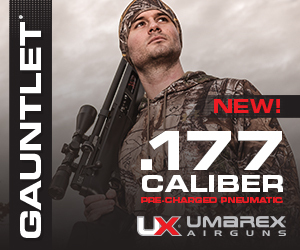 Internally, there’s no sign of lens bracing to resist the fierce forward recoil of the 1,200 FPS + airgun it’s sold with. So it’s unlikely that this scope will have a long life unless you get very lucky. The rings are very flimsy too. They have only one clamping screw each side and there’s no stop screw on either ring to arrest recoil. 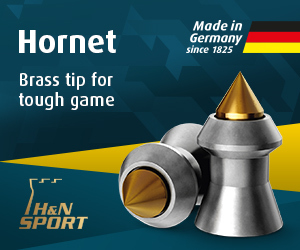 It’s likely that these rings are not strong enough to hold the scope in position after it’s sighted-in. The HAM Team feels that – even if you’re prepared to tolerate the poor optical performance of this 4 x 32 bundled airgun scope – you’ll need to replace it after a fairly short time because of these mechanical shortcomings. Resolution and contrast data will be given in this section of the review using data generated by Trioptics. These data will generally cover optical performance at minimum magnification and maximum magnifications. Trioptics data is TBD for this review. HAM testers set up this 4 x 32 bundled airgun scope at 10 yards from a horizontal ruler, marked in inches. At the left margin we could just see the 12-Inch mark. On the right, the 52-Inch mark. That gives a Field of View of 40 Inches at 10 Yards. In this section, HAM test reviews will indicate actual maximum and minimum magnifications achieved by the scope. This will come from Trioptics data. 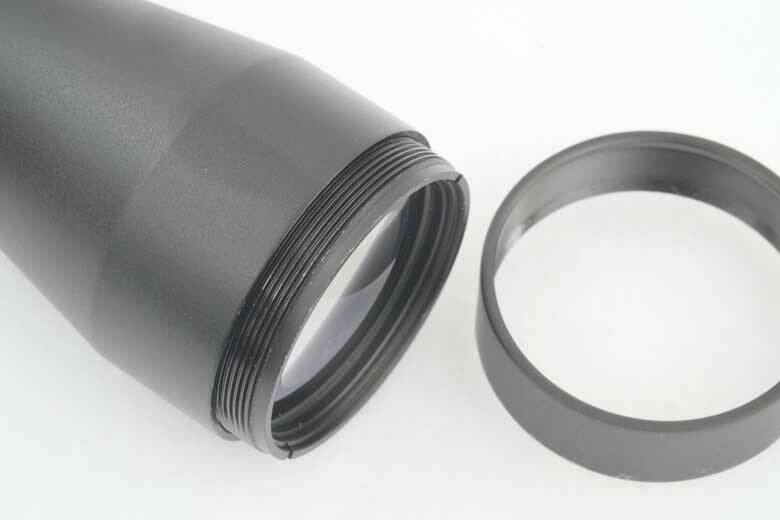 Also we will show the actual magnification at the marked “9x” magnification given on the scope’s zoom ring. We will also include Exit Pupil diameter and Eye Relief measurements at all three magnifications. As this 4 x 32 bundled airgun scope has no zoom capability, we can simply report that HAM testers found the Exit Pupil diameter measured 11 mm and the Eye relief was a long 3 7/8-Inches. The large Exit Pupil diameter may make the scope easier to use, as eye position is less critical than with a small Exit Pupil. But the overall low quality of the scope makes it unlikely that the user will find it easier to use than a higher quality scope with a smaller Exit Pupil. 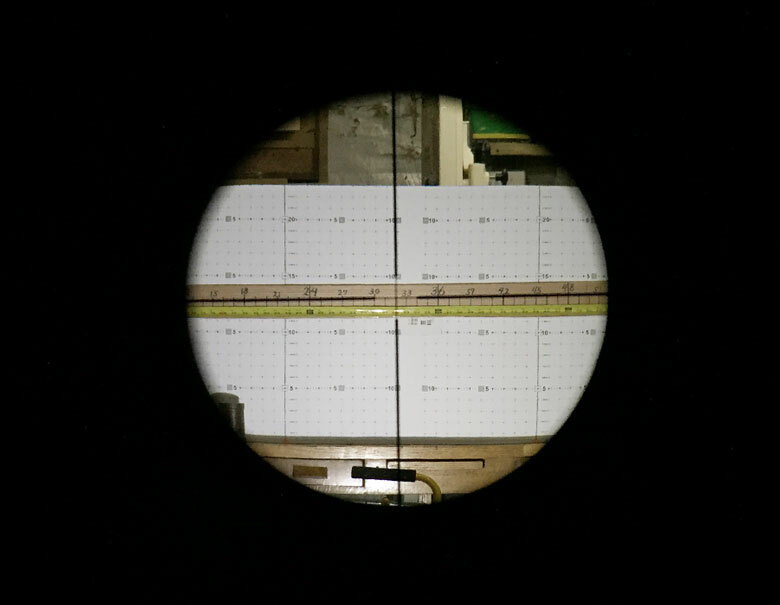 Regular HAM scope tests will compare the distance markings of a scope’s AO or side parallax adjustment with points of sharpest focus at fixed distances downrange. 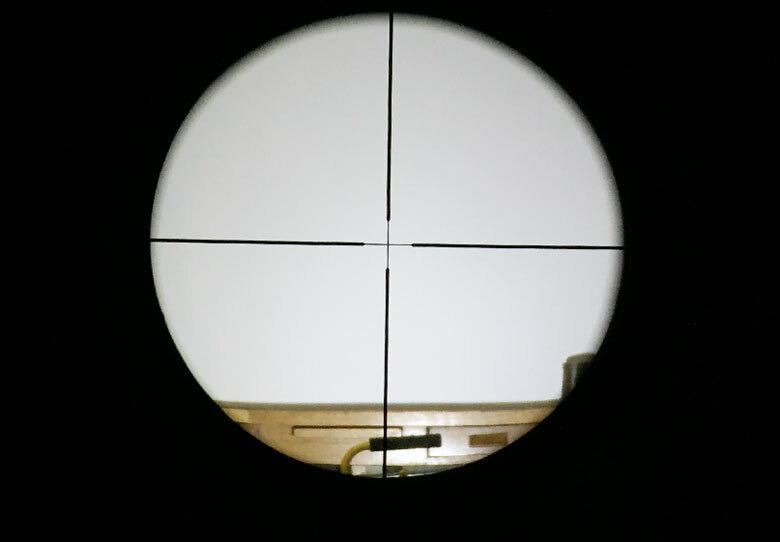 As the 4 x 32 bundled airgun scope has no “official” parallax correction capability, this part of the test was not possible. However, the HAM Team did note that the sharpest focus was achieved at 10 yards, dropping away with distance. At 40 Yards, Ham Tester Doug Wall noted that sharpness had become “Not very good” at 40 yards range and beyond. Doug is a master of understatement! This section of the test will also cover the measured accuracy of reticle dots or hashes. Again, as this 4 x 32 bundled airgun scope has an un-graduated reticle, there’s nothing to measure! Reticle accuracy will be measured by comparison to the Rex Grid, 100 Yard MOA Grid Scope Testing Target produced by Box To Bench Precision. 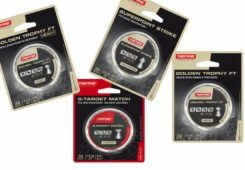 HAM simply factors-in the difference using this 100 Yard target at our much closer test range. Contrast and resolution – among other things – vary with magnification. This means that – in order to compare the optical performance between different scopes – we need to do so at a set magnification. For this, we’ve chosen 9 x magnification, as this is common to the vast majority of airgun scopes. Of course, the 4 x 32 bundled airgun scope being tested here does not achieve 9 x magnification. So we ‘ll compare it at 4 x because that’s what it is! 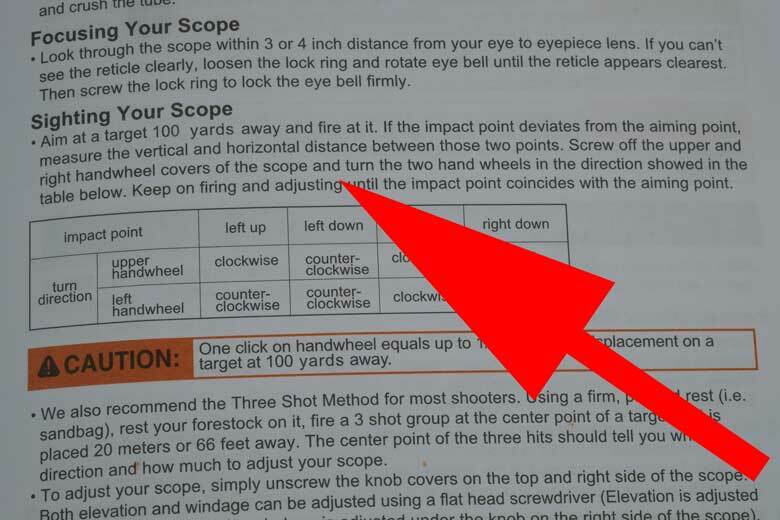 Yes, this 4 x 32 bundled airgun scope is penalized by this decision – even more so as the magnification is actually 2.9 x. We’ll see how much once we have other riflescope test data to compare against. 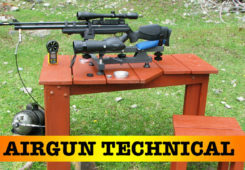 As we can see from the table below, the 4 x 32 bundled airgun scope tested by HAM gave a wider Field of View, longer Eye Relief and larger Exit Pupil diameter than the maker’s claims. All of these measurements indicate that the actual magnification of the 4 x 32 bundled airgun scope tested by HAM was significantly less than 4 times. A common calculation for magnification is to divide the objective lens diameter by the exit pupil diameter. Using the HAM test measurements, that gives 31.6 / 11 = 2.9X magnification. So, the 4 x 32 bundled airgun scope actually was a 2.9 x 31.6 scope! Although the 4 x 32 bundled airgun scope tested by HAM had a fixed focus, it could be focused for one specific distance if required. 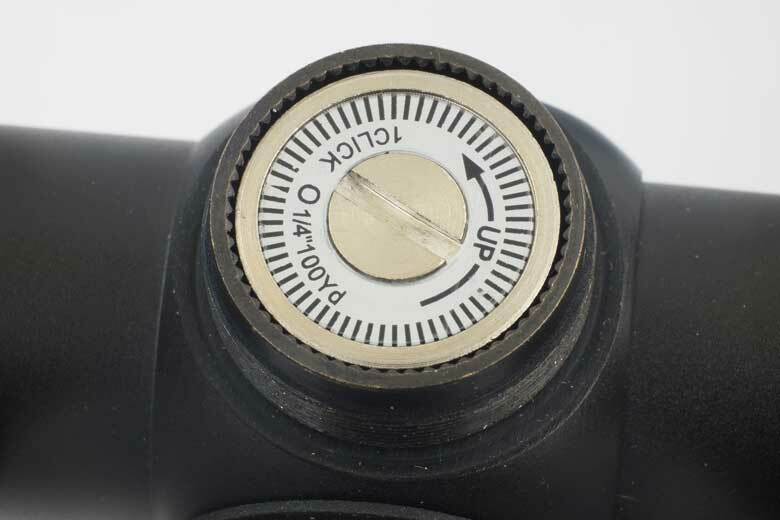 Although not all fixed focus scopes have this capability, the end ring around the objective lens can be unscrewed. 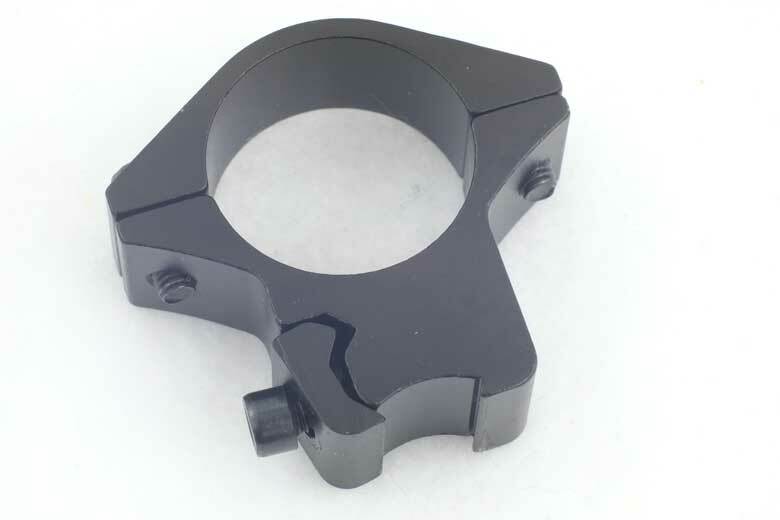 This reveals the objective (front) lens in its mount. Note that some front rings are glued in place and will not unscrew. If it won’t move, don’t force it! Now, if you rotate the objective mount carefully, you will find that you can set the scope to provide its sharpest focus at one particular distance. Simply screw the end ring back into place to hold the scope at this focus. This means that – if you normally shoot at a specific range – you can set this 4 x 32 bundled airgun scope to give its best performance at that distance. This can be an useful benefit for this scope, although not all bundled scopes can do it. Rather less good are the instructions for use. In this case, these are included as part of the overall instructions for the air rifle. However, as we can see below, the new user is advised to sight-in the scope at 100 Yards. 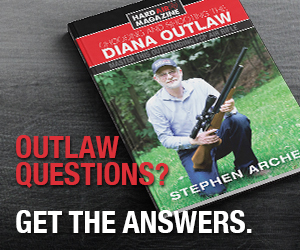 Really – with a .177 caliber break barrel???? To be fair, we have seen other bundled airgun scope instruction manuals which also tell the user to sight-in at a similar range. But this is just plain wrong! At least these instructions also suggest a second method of sighting-in at 20 Yards or Meters range. That’s much more likely to lead to success. 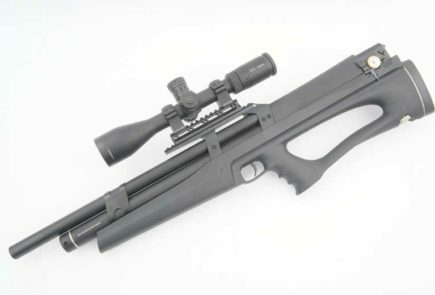 This 4 x 32 bundled airgun scope is fitted with “hunting turrets”. Both elevation and windage turrets are equipped with dust covers that protect them from being adjusted inadvertently. So, the scope is obviously not intended to allow for adjustments to elevation or windage in use. 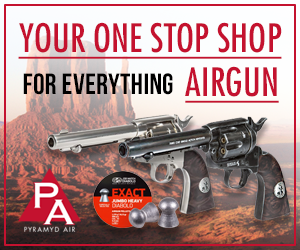 In principal, this is fine – that’s what most airgunners want. Therefore, in order to compensate for changes of range or crosswind, it’s necessary to aim off. Again, no problem in theory. Unfortunately without any type of reticle dot or hash markings, aiming off becomes more a matter of luck than judgement. No scope designed for airguns should have an un-graduated reticle! That, in itself, is a major issue with this 4 x 32 bundled airgun scope if you actually want to hit the target at any range and in variable wind conditions. And isn’t that all of us? “Bikini type” elasticated front and rear lens covers are included with the scope. 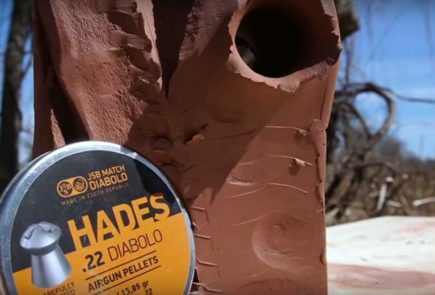 These protect the lenses when not in use and are simple but practical. In future, we will have the real hard data on this scope’s performance! This is generated by TRIOPTICS’ comprehensive, dedicated, ImageMaster Afocal riflescope test system. It’s a combination of extremely sophisticated hardware test bench and software. TRIOPTICS own experts used this system to generate data for this HAM riflescope test reviews. So you know it’s the best there is!